One thing that Sky is involved in is singing at various events for Veterans. 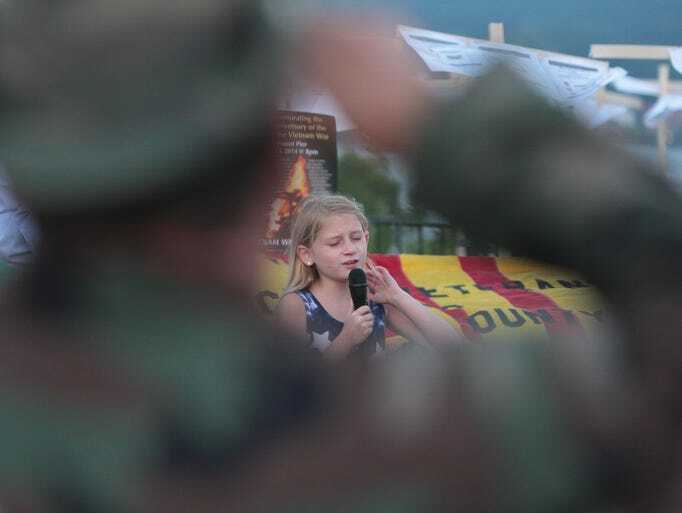 She recently sang the National Anthem when the Veterans marked the 50th anniversary to the beginning of the war in Vietnam with a memorial watchfire at the Piermont Pier(soulful picture of her singing from the local newspaper) and at the MIA/POW Ceremony at Rockland Community College. Without our Veterans we would not be able to enjoy the freedoms that we have each and every day. We should all take the time to thank those in our lives who are true heroes and have risked their own lives to save the lives and freedoms of others. What I find the cutest about the whole thing is that she is more nervous performing at these events with around 100 people than she was performing at Boulder Stadium with thousands of people. She said she knew how special it was for her PopPop that she did her best and it made her extra nervous. Her grandfather is a former county commander of the American Legion. Her uncle is also active service in the United States Army for the last 14 years.